What exactly is a Corn Dolly? When early man ceased his nomadic existence as a hunter-gatherer and settled down to cultivate the earth and produce food, he believed that the success of his labours was highly dependent on various deities who would oversee the cycles and fruitfulness of his crops. To this end, various sacrifices and ceremonies would be held to propitiate his gods. These early beliefs are to be found in civilisations all over the world, particularly where cereal crops are concerned. Wheat is one of the first cereals known to have been domesticated, and archaeological records suggest that this first occurred in the regions known as the Fertile Crescent in the Near East, and the Nile Delta. Some of the more well known deities were Ceres, the Roman goddess of the harvest (from which we get our word �cereal�); Demeter (Earth Mother) the Greek goddess of the harvest, and Isis, the Egyptian Goddess of Fertility. So wherever cereal crops were grown, the underlying legend still remained: it was thought that the Corn Spirit retreated before the oncoming reapers at harvest time, taking refuge in the last of the standing corn. These last few stalks would be fashioned into a Corn Dolly, a receptacle in which the Spirit could rest during the winter. 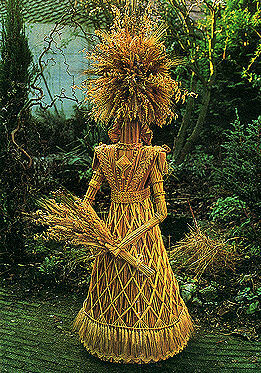 In the spring, the Corn Dolly, together with its incumbent Corn Spirit, would be returned to the fields with the new planting. By giving the Corn Spirit a home during the dark and cold winter months, it was hoped to ensure that the forthcoming crop would be a bounteous one. 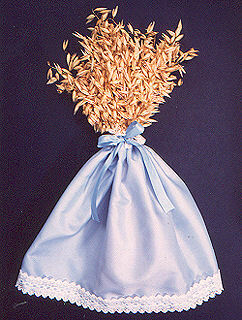 The term �Corn Dolly� is a relatively modern generic one, coined in the early part of the 20th Century, together with names such as Cambridge Umbrella, Stafford Knot, Suffolk Horseshoe, etc. 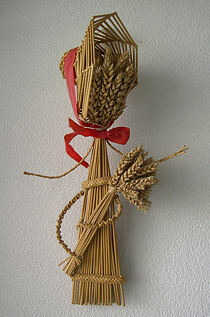 which described the style of a Corn Dolly from a particular region. Prior to this they were known as 'Harvest Trophies'. 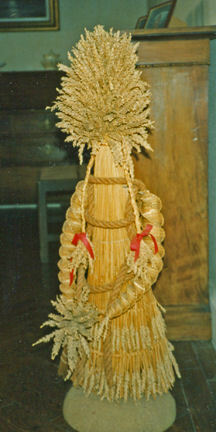 The centuries old local names for the figure created from the last precious stalks of wheat were (and still are) used, names such as Cailleach, Churn, Clyack, Corn Maiden, Hag, Harvest Maid, Ivy Girl, Kern Baby (Kirk baba), Kern Maiden, Maiden, Mell, Mare, and Neck � and in other countries, Arûseh (Corn Bride) and Corazón (Heart). 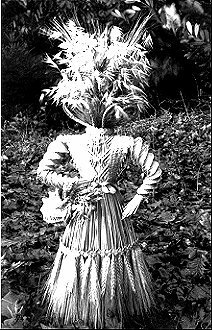 Joan Hart�s full size "Ivy Maid of Kent"
In this day and age, with our scientific knowledge of germination, fertilisation and crop cycles the old superstitions are but a thing of the past, but the Corn Dolly can still be regarded as an attractive symbol of the earth�s fertility. 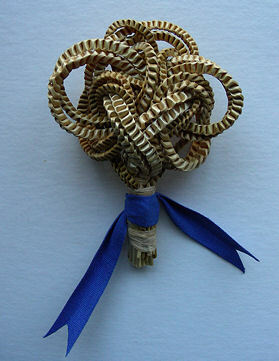 It is popular both as a reminder of our agrarian history, and a welcome gift for a marriage, handfasting, christening, housewarming or other special occasions. 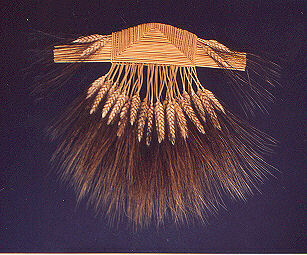 Intricately woven, or plain and simple, these small pieces of straw work do not embody the Corn Spirit, but are small tokens exchanged as an expression of love between a young couple, the heartfelt thanks for a harvest brought in, or a display piece to demonstrate the plaiting skills of the giver. There are two examples of harvest trophies on this site Pictures of Harvest. Harvest trophies at the Pitt Rivers Museum in Oxford. (pp 141-142) Oxford University Press (1996) ISBN 0-19-288045-4. Click on the links below to email us. This material on these pages (text and graphics) is owned, held or licensed by The Guild of Straw Craftsmen. Copyright of photographs on these pages is retained by the owner where acknowledged. It is being provided solely for the purpose of presentation or individual research. Any other use, including commercial reuse, mounting on other systems, or other forms of redistribution requires the permission of The Guild of Straw Craftsmen.